As Google continues to move into social media, it seems impossible for search engine optimization professionals to look the other way. Following last month’s announcement of the Google +1 button, the company’s intents to reclaim their share of web activity from social sites like Twitter and Facebook are clearer than ever. Behold, the coming tide of Google+. This entry was posted in Search Engine Optimization on June 29, 2011 by Daniel Page. 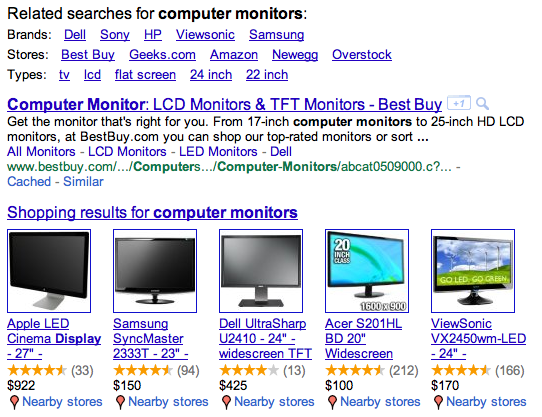 Look at how a simple Google search for computer monitors has changed in the past year (below). Study it. It may not be long before all of your search results look this way. This entry was posted in Search Engine Optimization on June 20, 2011 by Daniel Page.